Lots of Console for the Money! 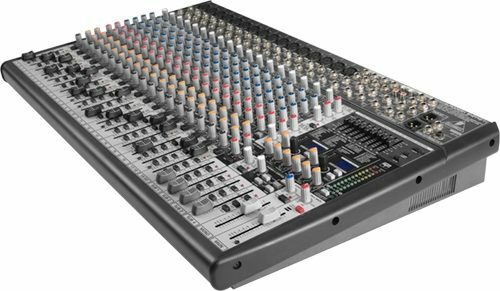 The Behringer SX2442FX Eurodesk mixer boasts a whopping 24 channels, including 16 fully fledged microphone channel strips outfitted with XENYX preamps and three-band "British" EQ -- because sounding great is just as important as having enough channels. Just try getting this many channels anywhere near this price from a different manufacturer. You can't. Behringer's manufacturing output makes it possible for them to offer an incredibly low price for professional-grade audio equipment. With 24 microphone channels, and an additional eight line inputs arranged in stereo pairs, you'll be able to mix rock bands, chamber groups, pit orchestras, choirs, worship services, and a whole lot more. In addition to the 24 true input channels, the SX2442FX gives you four subgroups for assigning group inputs to a single fader. Use the subgroups to control an entire drum kit or all the backup signers from a single volume fader, or use them to create specific monitor mixes for different performers. You also get a mono output that can be used as a center channel, a monitor send, or a subwoofer send. This may seem like a lot of routing options, but the Behringer SX2442FX is just giving you what any serious venue needs. Behringer Eurodesk mixers certainly do not champion quantity over quality. Each of the 24 microphone channels features Behringer's crystal-clear XENYX preamps, renowned for their low self-noise and transparent gain architecture. They make the perfect complement to the three-band "British" EQ on channels 1 through 28. By "British," Behringer means the kind of warm, musical equalization (or "equalisation") that British console manufacturers specialize in. In stark contrast to the surgical EQs found on most American-designed consoles, the SX2442FX's British EQ makes it easy to dial frequencies in (or out) in a way that always sounds "pleasant" to the listener. In other words, it's hard to make this board sound bad. Typically you'd need to buy a separate unit dedicated to the destruction of feedback, but the Behringer Eurodesk SX2442FX comes with an intuitive and effective system built in. Just activate the FBQ, and watch the LED's under the seven-band master EQ light up, indicating problem bands for whatever space you're working in. Simply adjust the EQ until the LED dims -- it couldn't be easier. Feedback is the biggest literal headache for any live sound system, and the SX2442FX makes feedback problems a thing of the past. Give your venue the sound it deserves, and the sound that serious musicians demand. Pick up a Behringer SX2442FX Eurodesk mixer at an unbeatable price from zZounds. Sound: I think it sounds good. We are a church choir that sings at various venues. We have some other components that I would like to replace for sound issues, but not this board. Feature: It does everything I need for a group of 7-9 singers and 3-6 instruments. Ease of Use: The controls are simple and intuitive. Quality: I had one input channel go out shortly after purchase, but I think it was my fault, over drove it a lot on accident and probably fried something. Never bothered to try and get it fixed because we were OK with one less channel most of the time. Otherwise it stands up to moves from location to location very well, still in the original cardboard box. Probably time to get a better case. Value: I think the price/feature ratio on this thing is great. I use the FX processor a lot and it works great. Manufacturer Support: I don't really know, never had to use it. The Wow Factor: It is clean, compact and very functional! Overall: We've had it for 3+ years and will keep it as long as it keeps going. "Super compact Behringer BEHSX2442FX mixer"
Sound: This is a great little board for the $. Feature: I would give it a 10, but feel it needed more Aux sends for my needs. Ease of Use: Super easy to use, right from the box. Quality: This is a great little board, built well, and rugged. Value: I selected this board because it is the best "bang for buck" period. Manufacturer Support: Have had no problems, but anticipate no issue with support due to the quality of the mixer for the $ The Wow Factor: The small format makes this a great modular component piece. Overall: I'll run it till it quits turning on, then probably order another or the newer version.